Prince Emmanuel Bibesco; Prince Antoine Bibesco [1878-1951], Paris, London, Leningrad and Strehaia, Romania. Acquired between 1952-1955 by Capt. Edward H. Molyneux [1891-1974], Paris; sold 15 August 1955 to Ailsa Mellon Bruce [1901-1969], New York; bequest 1970 to NGA. See letter dated 22 September 1999 from Guy Cogeval, in NGA curatorial files. See letter from Molyneux to Bruce dated 30 July 1955 in Gallery Archives RG39, copy in NGA curatorial records. Provenance according to NGA curatorial records and the Ailsa Mellon Bruce notebook now in NGA archives. 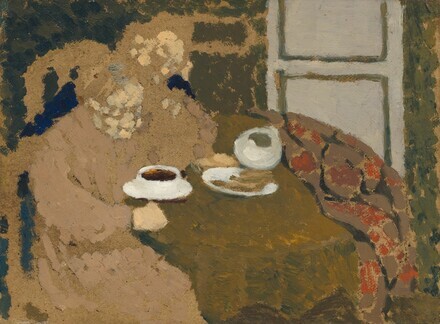 The Intimate Interiors of Edouard Vuillard, Museum of Fine Arts, Houston; The Phillips Collection, Washington; The Brooklyn Museum, 1989-1990, no. 61, repro. Small French Paintings from the Bequest of Ailsa Mellon Bruce. Exh. cat. National Gallery of Art, Washington, D.C., 1978: 100, repro. (continuing exhibition beginning in 1978). Salomon, Antoine, and Guy Cogeval. Vuillard, The Inexhaustible Glance: Critical Catalogue of Paintings and Pastels. 3 vols. Milan and Paris, 2003: 1:no. IV-64, repro., as Two Woman Drinking Hot Chocolate.